When most people see upgrade and drum brake in the same sentence, it usually has the words from, to, and discs in it as well. Well not for me! My 2-door Trueno GT is the lowest level on the specification tree, below GTV and GT Apex, and apart from its very lightweight cloth AE85 interior, it also sports a retro cool drum brake set up on the back axle. Interestingly the 2 door Trueno GT is also the lightest AE86 from the factory, listed at a supple 905kg, having no silly electrical gadgets or heavy seats to weigh it down. Manhandle windows for the win! 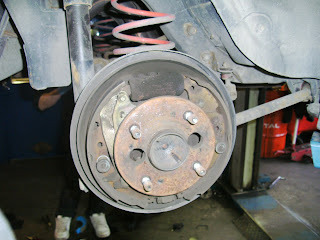 But back to the brakes... the rears had been performing poorly for the past few weeks, either braking weakly or else locking on, and an inspection revealed that some leaky brake cylinders were partly to blame. I had also seen some cool uprated brake shoes made by a company called RIGID in one of Kev's Japanese Levin/Trueno books, No other info was available on them other than that they were uprated brake shoes for AE86. Sounded good to me, so a mail was sent to RHDJapan to see if they were still in production and could be sourced. I was in luck and the company was found, and they made me a set to order. 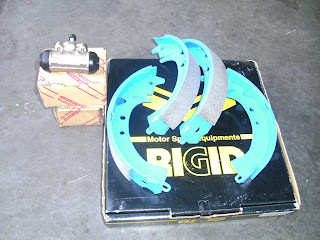 3 months later, a cool set of brake shoes arrived in the post. 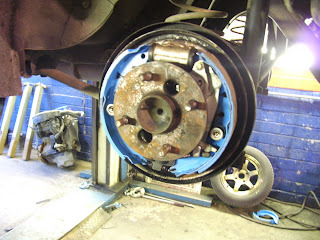 Some brand new Toyota brake cylinders were also ordered from the friendly local dealer. So this weekend I cruised up to GH once again and we commenced the strip down. Seeing as the brakes had not really been working 100%, the drums were actually in very good shape, and only required a quick sand down and a clean to give a fresh surface for the new shoes to bed in on. (Ill paint them high temp black some day to finish the job). Everything went in straightforwardly, with all the parts cleaned and adjusted back to spec. The whole system was bled thoroughly as well and the pedal feel is perfect now. Big thanks to Kev for doing pretty much all of it, his work is 110%. I was having a bit of a non functioning weekend not helped much by a suprise nasty hangover on Sunday morning too haha. I spent quite a while researching all of the different pads available, and this set seemed to have the widest operating temperature range as well as a good friction coefficient for a nice bite. Being my daily car it was just as important to have pads that work well from cold on commute to work as well as taking a roasting when driving hard. No brake upgrade is complete without braided lines, and the extremely high quality offerings from APP were also installed to give that solid pedal feel. There is also a braided line between the axle and body of the car, and everything else is hardline. Having drums on the rear I didnt need the rear set so they were donated to Sarah's Levin which just happened to need rear lines at the time. Nothing goes to waste in GarageHachi!